The court decides appeals from decisions made by state courts and from some decisions made by state and municipal agencies. The court adopts rules of procedure for civil, criminal, family, probate, environmental, and appellate cases. Boards and committees appointed by the court make recommendations about these rules. The court oversees the management of the statewide court system by the court administrator. The court oversees the admission of attorneys to practice law. The court oversees the discipline of all judicial officers and attorneys. In 1777 the first Vermont Constitution established courts of justice in every county. At its first session in 1778, the General Assembly created special temporary courts to hear cases. At a later session that same year, the Legislature established the Superior Court. The Superior Court had a chief judge and four other judges chosen each year by the governor, the Governor's Council, and the House of Representatives. The superior court judges met four times a year for a week at a time in four different locations around the state. Decisions of the Superior Court could be appealed to the governor, the Governor's Council, and the House of Representatives. In 1782 the Legislature reorganized the Vermont court system and established courts in each county. Each court had one chief judge and four or five assistant judges elected by county voters. The Legislature abolished the Superior Court and created the Supreme Court. Each year the Legislature elected the Supreme Court’s five judges. The Supreme Court judges met in each county once during the year. The Supreme Court and the county courts heard many of the same types of cases. Litigants could appeal cases tried in the county courts to the Supreme Court. Before 1786 many of Vermont's judges were not lawyers. Judicial candidates simply tended to have strong common sense and a record of military or community service. The first lawyer was elected to serve on the Supreme Court in 1786. By 1789 all Supreme Court judges were lawyers. In 1797 the Legislature required Supreme Court judges to put each decision in writing and to have the court clerk record the opinions. In 1823 the Legislature appointed a reporter to collect and officially publish the decisions of the Vermont Supreme Court. The Vermont court system was reorganized again in 1825. Although voters in each county continued to elect two assistant judges, the Supreme Court judges became the presiding judges in county courts. Each Supreme Court judge traveled to various counties during the year to hear cases. The judges had duties in county courts and served as the Vermont Supreme Court when all the judges sat together for Supreme Court terms. Supreme Court judges presided in county courts until 1906. In 1906 the Legislature changed the number of judges and separated their functions. The Supreme Court consisted of four judges who held hearings, or “terms,” in Montpelier. Supreme Court judges no longer had to travel to the county courts. In 1908 the size of the Supreme Court was set at five judges. It has remained the same since then. In keeping with modern practice, the judges of Vermont's highest court are now called "justices." In 2010 the Legislature unified the court system into a single Superior Court, under control of the Supreme Court. The Superior Court has five divisions—civil, criminal, environmental, family, and probate. Each division has a unit in each county, except for the environmental division, which is a single statewide unit. 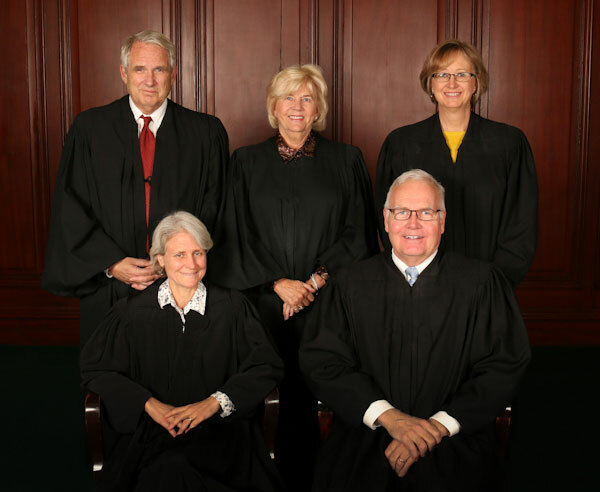 The Vermont Supreme Court is made up of the chief justice and four associate justices. Justices are appointed by the governor from a list of well-qualified candidates prepared by the Judicial Nominating Board and are confirmed by the Senate for six-year terms. If a justice wants to continue serving after the six-year term expires, the General Assembly votes on whether to retain the justice in office for another term. The clerk of the Supreme Court and the clerk's staff are responsible for the daily operations of the court. Legal documents are filed with the docket clerk. The clerk also serves as state court administrator. The court administrator works under the direction of the Supreme Court to manage the state court system. Each justice has a judicial law clerk to assist in doing research and drafting decisions. The law clerks are usually hired for a one-year term. You can find the court's law clerk recruitment notice, if any, here. Listen to audio recordings of recent Supreme Court oral arguments. The Supreme Court resolves every case with a written decision. Some decisions are made by three justices, and some are made by all five justices. The Vermont Supreme Court issues published opinions and both published and unpublished entry orders. Please note that the decisions that appear on this website are not the official versions of the court's entry orders or opinions. One opinion issued on Friday, April 19, 2019.